If you have to withdraw cash with your card in Japan, you can't simply to look for an ATM. 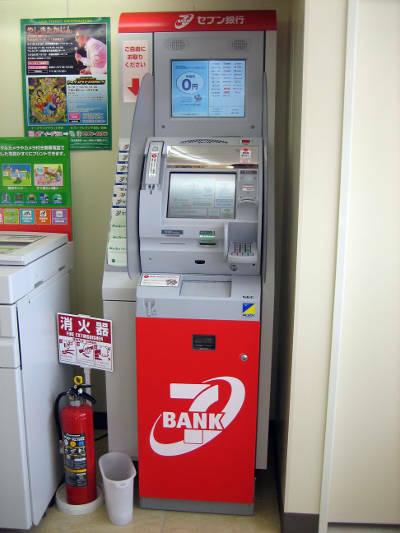 Many ATMs, called, the same as in English, "ATM" in japanese, do not work with cards issued abroad. Fortunately, the situation is changing very quickly, and more and more banks are updating old ATMs to allow them to be used with foreign cards. Finding an ATM that accepts foreign cards is fairly simple nowadays. Where to find it: in most of Seven Eleven convenience stores (over 23 thousand scattered throughout the country), in virtually any town there is at least one. Hundreds in the Tokyo area. Sometimes they can also be found in other places, in some large shopping centers and in several airports. Through this web page you can find the nearest Seven Bank ATM.. Accepted cards: Visa, Visa Electron, Visa Plus, Mastercard, Cirrus, Maestro, Union Pay, American Express, JCB, Discover, Diners Club. Hours: 24 hours a day. Short breaks of a few minutes depending on the card system around midnight. Withdrawal fee: Zero (however, your bank might charge fees too). Maximum amount: 100,000¥ (30,000¥ for American Express). Available languages:: english, french, german, portuguese, chinese, korean, thai, malaysian, indonesian, vietnamese, japanese. Useful resources: 7 Bank website. Accepted cards: Visa, Visa Electron, Visa Plus, Mastercard, Cirrus, Maestro, Union Pay, American Express, JCB, Discover. Hours: it depends on the post office. In some central areas of large cities 24 hours a day. Depending on the size and the place where the post office is located, opening hours may vary and sometimes they completely close on weekends. Withdrawal fee: 216¥ for some cards. Zero for others (however, your bank might charge fees too). Available languages:: english, french, german, spanish, portuguese, chinese, korean, tagalog, thai, malaysian, indonesian, vietnamise, russian, arabic, japanese. Useful resources: Japan Post website. 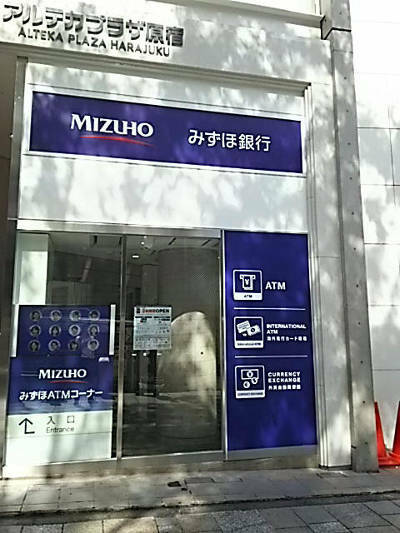 Where to find it: not all branches of Mizuho Bank have international ATMs, but only a few of them. In this web page you can find the list of branches that have ATMs enabled for international cards. Accepted cards: Visa, Visa Plus, Mastercard, Cirrus, Maestro, Union Pay, JCB, Discover. Hours: it depends on the branch. In some central areas of large cities 24 hours a day. Depending on the size and the place where the bank is located, opening hours may vary and sometimes they completely close on weekends. Withdrawal fee: Zero (however, your bank might charge fees too). For some cards the currency conversion service is available, which allows you to be charged in your currency instead of in yen. Available languages:: italian, english, french, german, spanish, portuguese, dutch, chinese, korean, tagalog, thai, malaysian, indonesian, vietnamise, russian, japanese. Useful resources: Mizuho Bank website. 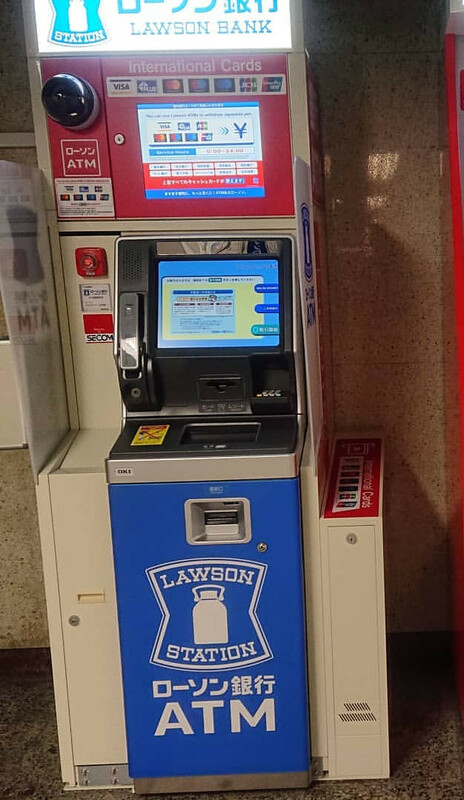 Where to find it: mainly in Family Mart convenience stores (but just some of them), but also in other some other convenience stores (Daily Yamazaki, Circle K Sunkus) and some Don Quijote. Through this web page you can easily locate all the ATMs region by region. Accepted cards: Visa, Visa Electron, Visa Plus, Mastercard, Cirrus, Maestro, Union Pay, JCB. Available languages:: english, chinese, korean, japanese. Where to find it: in some Lawson convenience stores. Through this web page you can find the ATM closest to you. Accepted cards: Visa, Visa Plus, Mastercard, Cirrus, Maestro, Union Pay, JCB. Useful resources: Lawson Bank website. Where to find it: in all the AEON Malls, in some MaxValu supermarkets, some Mini Stop convenience stores, and in other places. Through this web page you can find all the ATMs region by region. Hours: it depends on the opening time of the place where they are located. In convenience stores sometimes 24 hours a day, in supermarkets and shopping centers generally 8-22. Available languages:: italian, english, french, german, portuguese, chinese, korean, japanese. Useful resources: AEON Bank website. 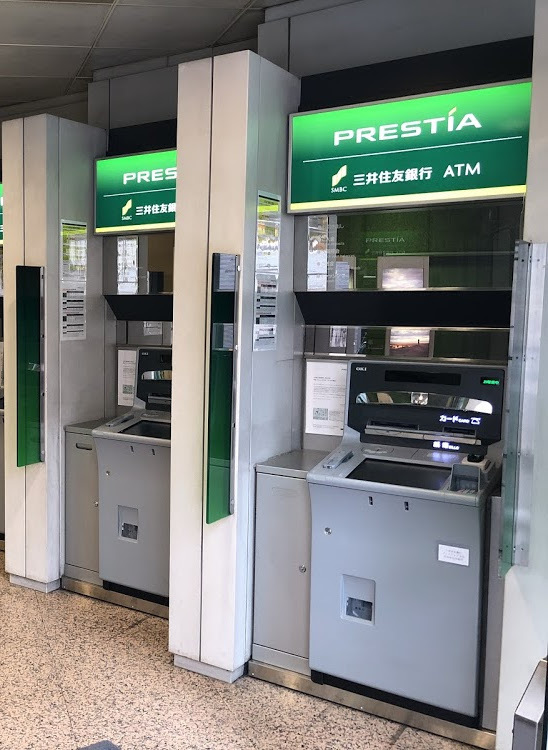 Where to find it: in all the Prestia branches, a bank belonging to SMBC Trust Bank targeted to foreigners residing in Japan. Most branches are located in Tokyo, very few in other regions. Through this web page you can find all the branches of Prestia. Hours: it depends on the branch. Generally 7-24 in weekdays, they close earlier on weekends and holidays. Useful resources: Prestia SMBC Trust Bank website. Which cards work in ATMs in Japan? 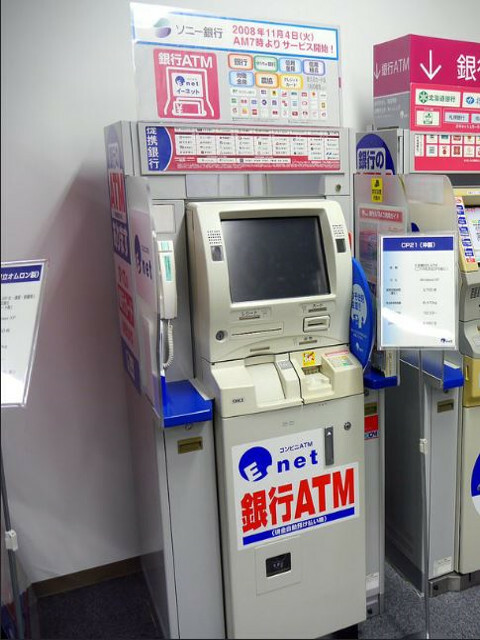 Visa, Visa Plus, Mastercard, Cirrus, Maestro, Union Pay, JCB are the most popular card systems in international ATMs in Japan. In some ATMs it is also possible to withdraw with Visa Electron, American Express, Diners Club and Discover. 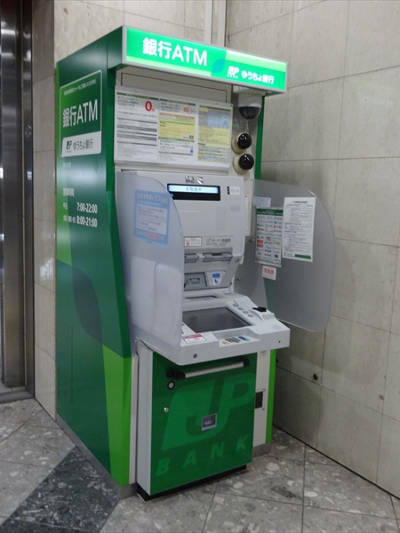 If you come from Europe, be aware that v-pay debit cards do not work in Japan, but only because these cards do not work in any extra-European country. Even if your card belongs to one of these card schemes, if this is your first time abroad, make sure with your bank that your card is enabled for withdrawals abroad. Sometimes some cards, unless you explicitly request the contrary, are blocked abroad to prevent fraud attempts. 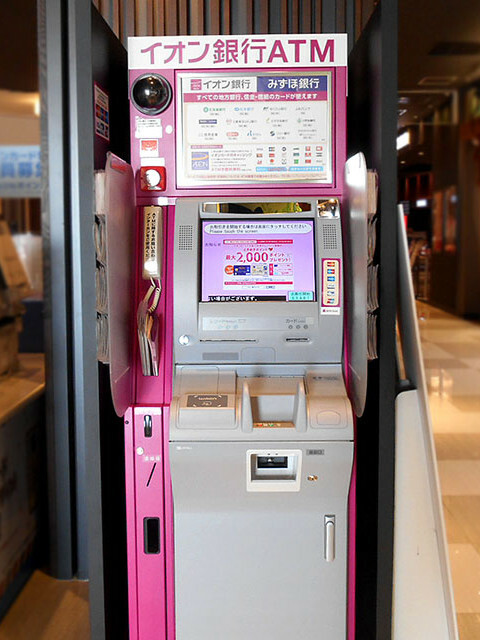 How much does it cost to withdraw with cards in Japan? Costs charged by your bank: many banks have a fixed and/or percentage fee when withdrawing abroad. Check the contract of your card or ask your bank to find it out. Exchange rate: the amount of foreign currency withdrawn will be converted into your card's currency, and the exchange rate used is never the official one. Generally the card scheme system (eg Mastercard) charges a small surcharge (0.5-1%), but some banks also apply an additional spread to the exchange rate. Adding up these three costs you realize by yourself that even a withdrawal can be quite expensive if you have a card with particularly unfavorable conditions.